Ms. Maricon Basco Ebron receives the awards on behalf of RP Tourism Secretary Durano from Daegu Metropolitan City Tourism Association Chairman Lee Hee-Do. For the first time ever, the Philippines raked in three prestigious awards in the just-concluded Tour Expo 2007 in Daegu, South Korea besting over 20 countries among 73 participants occupying 189 booths in this international event. Tourism Secretary Joseph Ace H. Durano announced the country's triple victories after Team Korea Head Maricon Basco Ebron of the Department of Tourism (DOT) has received the awards in his behalf from Daegu Metropolitan City Tourism Association Chairman Lee Hee-Do and Korea Tourism Association Chairman Shin Jook-Mok at the EXCO, Daegu. At the awarding rites were a various tourism officials and members of Korea's national assembly and the diplomatic corps. "The awards reflect the earnest efforts of the DOT in promoting Philippine tourism in South Korea's outbound market, now our country's biggest source of foreign tourists, posting more than half a million arrivals last year," Durano said. The three awards, according to Ebron, were Best in Tourism Publicity, Best in Booth Operation and Best in Folkloric Performance. Sponsored by Philippine Airlines, the Philippine booth donned unique merchandising features, creative point-of-sale display, and attractive raffle promo and outstanding performances of the ROFG (Ramon Obusan Folkloric Group) that lured throngs of Korean visitors. "These factors accounted significantly for our triple win," Durano said. Similarly competing for visitor attention are various tourism entities, organizations and government agencies from such countries as Japan, Thailand, Hong Kong, Malaysia, Macau, Indonesia, China, Maldives, Turkey, Mongolia, Ecuador, Romania, Bulgaria, Sri Lanka, Egypt, South Africa, Bangladesh, Botswana, Laos, Kenya, Korea and the Philippines. These exhibitions came up with various stunning displays, marketing promos, and cultural performances, which the Philippines best in three important award categories to post the most number of honors received during the event. 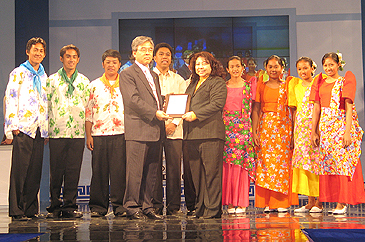 The awards topped the DOT's feat last year when the Philippines won two awards – Best in Tourism Publicity and Best in Booth Operation – in the same event. "This year's wins also proved the wisdom in DOT's market-specific promotional strategy, which is based on the actual requirements and nuances of the Korean market," Durano said. The DOT has been promoting Philippine tourism in Korea localized marketing targeted at four major market segments – students, honeymooners, holidays seekers, and incentive and special interest groups. "Our strategy in Korea is summed up and highlighted by the "7107 Philippines: More Than You Can Imagine" marketing communication handle that provides the visual idiom for the 7.107 islands, activities, or reasons for Korean tourists to come to the Philippines. And these are simply more than the Korean can imagine," Durano explained. Being essentially localized, the DOT's marketing strategies vary from country to country, depending on each market's mindset and preferences. "The objective is to attain top-of-mind-recall for the Philippine brand in each of our priority markets, where we enjoy a distinct advantage that we can leverage to achieve maximum results amid the currently confusing brand clutter," Durano said, citing the Philippines as Korea's nearest tropical neighbor with a long history of diplomatic ties.